In the current era when technological advancements are happening very rapidly, the businesses need to leverage technology for better customer engagement and to stay in the competition. The brands have to be creative and quick in coming up with new ideas and implementing them to stay ahead of the competitors. Staying behind the technology has made even the great firms to fail. New technological changes have disrupted many traditional well-established businesses. No one could imagine that digital technology could be used in those businesses. Also, Consumers have become very tech-savvy. This is why investing in digital innovation has become an integral part of the company growth strategy. Most of the manufacturing companies have a dedicated team to work on digital innovations. Digital technology has opened new ways to engage the customers in the offline market. But it becomes very challenging for the non-tech companies to implement digital ideas as technology is not their core strength. NeuroTags offerings help in implementing digital innovation ideas and increasing customer engagement. NeuroTags offers algorithmically coupled technology tags to help the brands in better customer engagement. The tags can be scanned using any smartphone. Applying these tag couples to the products opens several ways to engage the customers. They increase the real-estate for the product from a static label to a dynamic and interactive page on the mobile with infinite possibilities and ways to engage the customers. NeuroTags also offers NFC based tags for the products such as high-end Bags and Clothing where products have a long life and engaging the customers continuously may help the brand in increasing the sales and brand visibility. The brands have complete control over the content to be shown on the scan of the product tag. They can display the product story, advertisement, product manual or the unique features of the product. The customers can get to know about an upcoming event or the campaign just by scanning the tag. The brands can also show different content to buyers based on their demographic location. Brands can show the content in the regional language where the tag is being scanned. For example, on the scan of the tag, a wine brand can show the dishes and recipes that go well with that particular wine. Or how and where the wine was made to create a personal connection and increase the customer’s trust. 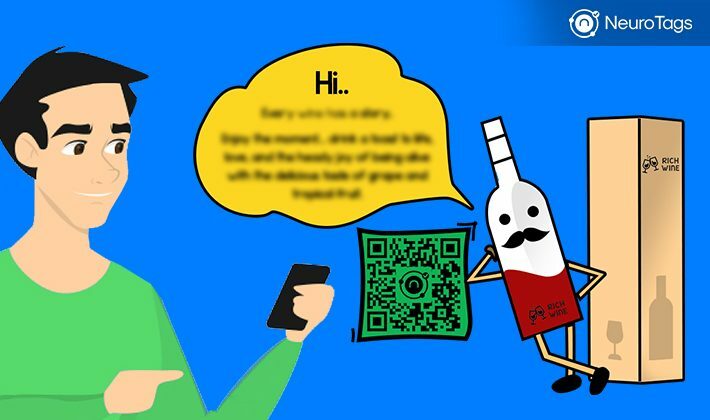 If the buyer purchases the same wine multiple times, then the brand gets an idea of the customer’s taste and based on that information the brand can suggest other must-try wines. The brand can also inform its wine lovers about the events such as the next wine tasting opportunity. If the brands can show engaging and exciting content to the buyers, the same tags help the brands in assessing the product performance by the tag scan activities. In a way, the product itself tells the brand how it is performing in the market.